Sonsup is edgy acoustic-rock with gritty vocals laced with harmonies, along with some electric guitar embellishments, both subtle and at times searing. This fathers and sons team of musicians are lighting a shoreline of generations with music that flows from new streams while holding a depth of experience reflecting the colors of life. At times it's brash, sometimes tender, but always real. The album highlights ramped up versions of tunes of the fathers’ (Sunup) tunes as well as the songwriting talents of their sons, Ethan James and Marshall Westlake Manuel. Supporting musicians on the recording include: Ed Castilano (Rochester Philharmonic Orchestra) lending his expertise on upright bass, along with the talented H. Luke Anderson (WAV Pool Records) on electric five-string bass and Ray Boss on drums. Sunup performed and recorded on and off for 30 plus years, doing shows at clubs, coffeehouses, colleges and opening for acts such as Jackson Browne, Linda Ronstadt, Jimmy Cliff and many others. They mixed original tunes with covers of songs by Seals & Crofts, John Prine, Buffalo Springfield, CS&N and others. The original duo of Garry Manuel and James D. ‘Goona’ Wilson played music for nearly 10 years in the 1970’s, before Goona left for Danbury, Connecticut to be a DJ on WRKI. His degree from Ithaca College paved the path to his career in radio. In Danbury he is known by his radio name, Ethan Carey, and remains on the air today doing the morning drive show. He and Garry also were in radio together at Monroe Community College (MCC) in Rochester. Sunup was actually born out of a trip to a concert in Syracuse to see the Moody Blues and the James Gang. They began singing The Beatles tunes a cappella in the car. Garry and Goona came back together with other Sunup alumni in the 90’s to record the Saratoga Sunrise album and recently released a mix of studio tracks, live shows from WCMF-FM and clubs in Rochester from 1973-75, which is titled, Passion & Politics. Perhaps one of the more disappointing realities of these tracks is that many of the same political battles rage today! The studio tracks were recorded in Rochester by renowned recording engineer, Mick Guzauski (Daft Punk, Eric Clapton, Chuck Mangione, etc. ), just prior to his own success story. The group was fueled by harmonies, acoustic guitar work and their songwriting that dealt with topics like Attica, destruction of farmland, and the days of Nixon. What Garry and James didn’t know was that they would one day have sons who would catch the music bug. The core of this recording features the prolific and autobiographical songwriting of Ethan James, whose life experiences can be discerned just by listening to the passion and expression in his vocals. Marshall Westlake Manuel has an acoustic-pop EP (Lost Again) and a CD (Proving Ground) that contains more R&B, beat driven, influences. Growing up, his favorite artist was John Mayer. Marshall is also a gifted recording engineer. He did 99.5% of those duties on this CD at RAMP (Rochester Area Music Project), where he and his father own and operate a music business that encompasses teaching, recording, indy label and sales (ramp-roc.com). Marshall has also been busy recording and producing several other upcoming acts (that we’re sure you’ll hear about soon). He also holds a Bachelor's Degree in Communications from the New England School Of Communications, now part of Husson University in Bangor, Maine, where he focused on audio engineering. Ethan James has been performing and recording independently in the Danbury CT area, doing clubs and a “Really Far From Home Tour,” performing in 10 shows in 10 days on the West Coast (Oregon, Washington, California and Nevada). He has also opened for headliners like Lesley West (Mountain) and Hotel California (Eagles Tribute Band) at the Ridgefield Playhouse, as well as some radio concerts and clubs like Acoustic Café in Bridgeport, The Chance in Poughkeepsie, The Note Kitchen and bar, clubs in Saratoga Springs, Zaragoza’s, and more. Garry Manuel is also the founder and board chair of the non-profit, Project URGE, Inc., which is an organization that focuses on finding solutions to issues surrounding poverty and race in Rochester, NY (www.projecturge.org). His passion toward justice and dismantling racism can be traced back to his early recordings. He also is President and an instructor at the Rochester Area Music Project ((RAMP). He has had his instrumental tune, Saratoga Sunrise, featured on the Saratoga Backstretch TV show in Saratoga Springs and has fond memories of meeting Hall of Fame thoroughbred horse trainer, Woody Stephens, after writing a song honoring the famed trainer. A couple years ago Garry suggested to Goona that they do an album with their sons. This idea was fueled by the four of them singing around the campfire and a cabin in the Adirondack Mountains. So, in 2017 Sunup transformed into Sonsup. The album shines on their unique talents, only to be eclipsed by their long time-personal friendship. The music can be stamped as edgy acoustic-rock with gritty vocals laced with harmonies, along with some electric guitar embellishments, both subtle and at times searing. 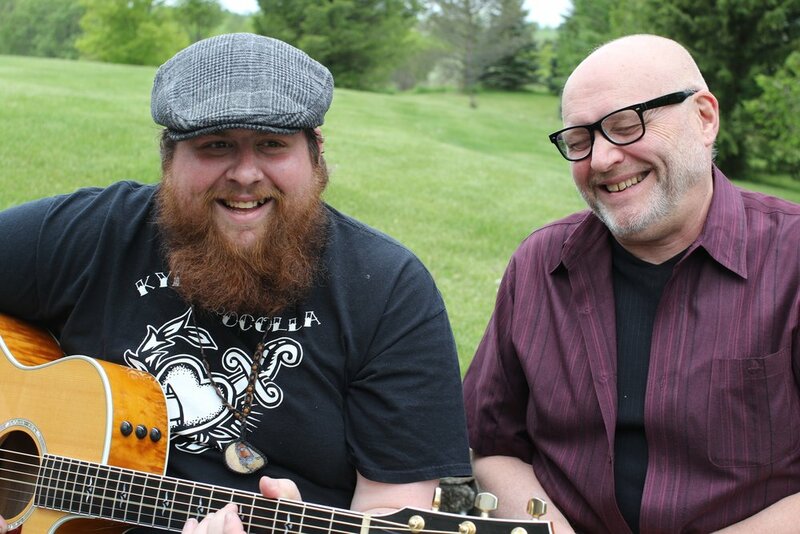 This fathers and sons team of musicians are lighting a shoreline of generations with music that flows from new streams while holding a depth of experience reflecting the colors of life. At times it's brash, sometimes tender, but always real. The album contains autobiographical songs penned by Ethan James, The Beatles cover of I'll Be Back, along with a couple ramped up Sunup tunes from the 70's, and more. The recording engineer was Marshall Manuel and the songs were produced by Garry Manuel. Further support was given by musical guests, Ed Castilano (brother of original bassist for Sunup), who performs with the Rochester Philharmonic Orchestra (RPO) on double bass, as well as H. Luke Anderson (WAV Pool Records) on five-string electric bass, and the skillful, intuitive drumming of Ray Boss.